When Victor Teboul was a young boy, he began writing a diary. The time was 1956 when England, Israel and France began the protracted conflict against Egypt over the Suez Canal. At the age of 11, he witnessed his father being shut away in jail and the subsequent expulsion of his family, along with thousands of other Jewish families. Still, he kept on writing in his diary. He stopped at the age of 18 when he came to Montreal. "We ended up in France as refugees in a monastery near Grenoble. Then we moved to Paris, and lived there for six years," said Teboul, noting his family was given one week to get out of Alexandria when war broke out - a place that nurtured his cosmopolitan outlook and ebullient spirit. "In Alexandria, my family spoke so many languages: Arabic, Greek, French, Italian - whatever suited the moment at hand. I had many Arab friends, a friend from Malta, friends from all over Europe. Alexandria was a mini world ", said the 57-year-old writer who went back to the city many years ago to visit the place that gave birth to his novel. "Everything had changed. You could only hear Arabic on the streets; life wasn't at all the same." 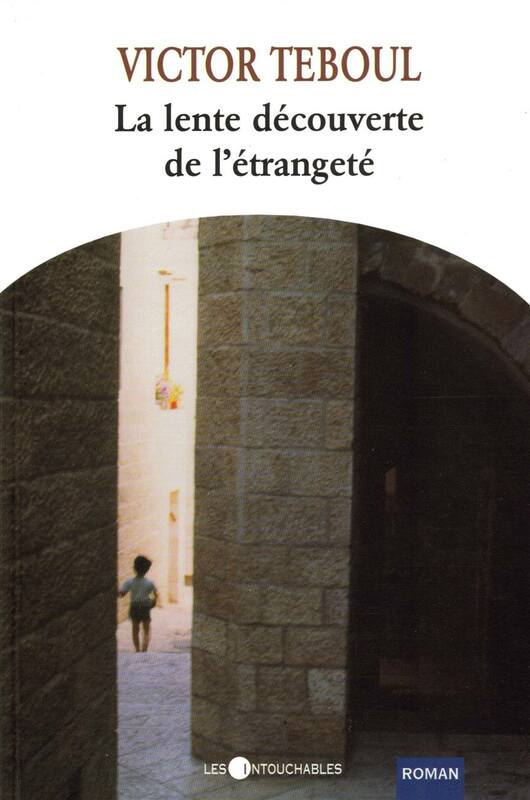 In his latest work, La lente découverte de l'étrangeté (published by Les Intouchables), Teboul introduces Maurice, a young boy totally at peace with the world. Part of the book explores this young boy's love affair with the multitude of cultures and languages swimming around him in Alexandria. He feels a part of everything - until war whisks off his father and family, and Christmas Eve becomes the last one spent in Egypt. The book takes place in Montreal, France and Alexandria, and it is a recollection revealed through diary form of the events leading up to this war, the aftermath and a new life in Montreal that centres on Teboul's family. It covers a period from 1950 to 1990. Moreover, the book delves into a generational issue where son confronts father many years after the war. He also confronts his own emotional transformation from joy and tenderness towards his native land to sorrow for it. Indeed, as events unfold and the boy ages, anger towards his passive father sets in, for Maurice wonders why his father never resisted being carted off to jail; nor did his father ever speak about the injustices the Jews suffered. In fact, the novel starts with his 90-year-old father handing Maurice (now 40) his diary recovered from a stack of books the father is organizing in their Montreal home. He knows he's not long for this world, and wants his son to repossess his precious diary. "The diary in the novel and the dialogue between the father and son is based on true events. My diary is three volumes; the book is only 177 pages," said Teboul, a cegep professor of French literature who still finds time to write. To date, he has authored six books, and is already working on another one that addresses the issue of immigrants and Canadian values. "I've had to take a six month sabbatical to write La lente découverte de l'étrangeté, but it's a book whose story had to be told," he said. "I've received so many e-mails from people who appreciated reading a novel based on the plight of Egyptian Jews, and the French press reviews have been extremely supportive too." Teboul possesses a Ph.D in French studies from the Université de Montréal, and was a former member of Conseil de Presse and Conseil Supérior de l'Éducation. He also wrote and hosted several radio series on Radio-Canada, one of which focused on Israel's 40th Anniversary. "I have experienced many hardships, but there is no message in my novel. I don't want to tell people what to think. I want them to participate in the experience. In writing it, I wanted to find something beautiful to talk about, despite what's happening in the world. You have to have hope." The Chronicle, West End Edition, Montréal, Wednesday, Sept. 25, 2002, p.7.